From Early English Romances: Done Into Modern English by Edith Rickert: Romances of Friendship, Chatto and Windus: London, Duffield & Co.: London, 1908; pp. 117-137, 179-181. IF ye will listen now a little while, I will make you blithe and merry with a tale that is true. In Naples all the land was governed by a noble king who had a fair and pleasant lady; and by her he had a son and heir whom he called Roswall. So comely was he that no other prince might compare with him, neither Ulysses1 nor Gandifer, nor Achilles nor Troilus, nor his father Priam, nor gentle Clariadus, nor fair Philmox, nor Florentine of Almayne; nor yet was the knight Sir Lancelot du Lac a match for him in beauty, nor he that cared so well for his father. Now in that country were three powerful lords that had wrought treason against the king; wherefore he put them into prison, and there kept them until they were aged quite away, all overgrown with hair, and so hopeless of their lives that they looked for death daily. When the young prince had heard their mournful groaning, he returned to his chamber as heavy-hearted as a stone. There he sat down and pondered how best he might help these lords, and presently bethought him of a wile by which he might trick the king. It was the custom of the gaolers who guarded these men, after the doors were all locked, to bear the keys unto the king, and he laid them secretly under the head of his bed. But the prince had perceived where he kept them, and, on a night, he watched until the king fell asleep, softly took the keys, and stole away to the prison, whence he delivered the three lords and bade them pass home again to their own domains. Then they swore: “By sweet Jesus, if ever ye seek help of us, we shall grant you it, as long as we three are living!” And so, thanking him with all humility, they hastened away to their own lands. He was glad he had done this deed, placed the keys quietly under his father’s pillow, and went to his bed and slept until daybreak. Then the king and queen arose, the prince and the lords, and went to Mass and afterwards to dinner. Meanwhile, all the gaolers had come and asked the king for the keys, which he was pleased to deliver unto them. They went to the prison to give out the morning-dram; but when they arrived their captives were gone. 119 They knew not what to say or do, but returned hastily to the king and told him that the prisoners were fled, how or what way no man knew. In all haste, the king sat down and wrote letters to ask that he might send his son to the King of Bealm,2 where he should continue until his home-coming might be. And he desired the king to take special care of his dear son, for that he trusted him utterly. With that, he took his leave of the queen and her ladies, who made great lamentation when he rode out of the town. May our gracious God be his guide! The knight leaped adown deliverly,3 and drank busily from the stream, and bade the prince likewise take his fill ere they should go farther. And as he lay on his belly to drink, the false knight seized him by the feet, and vowed that he should be thrown into the deep waters unless he swore an oath willingly to render unto him both the gold and the letters and to become his servant and wait upon him, day and night. This the child swore, to save his life; and so the master turned knave and the knave master. The prince gave up what was desired; and the two mounted and went on their way until they came to the land of Bealm. When they approached the king’s palace, Roswall made sorry cheer, for the knight forbade him to ride farther. He intended to hire servants in the town, in abundance and of all fashions. So he rode away with his gold, leaving poor Roswall on the ground, moneyless and shivering, with never a penny to buy him a dinner though he should die. “They call me Dissawar in my country,” he answered. He answers: “He is full welcome, for so I have got good company. Then they passed to their supper, and for his sake had the better cheer. Comely Dissawar said grace after the meal, and they went to their beds and slept till it was near day. Right early in the morning, as soon as they could see the dawn, they arose and dressed and went quickly to school. But the steward took Dissawar and brought him to the king’s notice. He had not been a month in service there when he was loved by old and young as if they had known him for a prince. Now the king had a fair daughter and no other bairns; and she was his heir. Her name was Lillian; and never read I of any woman more fair than she, not the noble French queen,8 nor the beauteous Lady Pelicane, nor fair Helen, nor true Philippie, nor the Lady Christian. Now this gay damsel chose Roswall for her chamberlain. The steward was sorry to part with him, but he could not say nay to Lillian; whereupon she was right fain, and entered the child in her service as being leal and wise and true. She took him in her arms and kissed him thrice; and he kneeled down on his knee, and thanked her heartily, saying: “Lady, may God reward you for loving so poor a child.9 I swear that I will return your love with all my might until I die!” He rejoiced in his heart, thinking more than he said. “If ye will have no other name, call you the king’s squire or his daughter’s chamberlain, for Lillian’s love!” She laughed, and once or twice embraced him, and so passed on to her ladies. And Dissawar was very glad for the joy he had of her. As the king his father was sending, messengers were at hand, with letters from the noble King of Bealm, which gladdened him. But they were both beguiled, and knew nothing of the case. The king had written in this wise to ask their son for his daughter; and rejoicing that such a marriage should be made, the King of Naples gave his assent to that writ, and answered, asking for what time the wedding was appointed, that he might send some of his lords to bear witness. The messengers returned and told their king; and he named the marriage-day, and sent back word. And the King of Naples caused an earl and two lords and two knights, with many a gallant squire, to go to the wedding. Now the King of Bealm caused a cry to be made that for three days there should be a course of war before him and his queen, to show who could do best at jousting for the sake of his ladies. With the knight’s help, Dissawar armed him; and he leaped stoutly on the steed and rode alone through the meadows till he arrived at the jousting-place. There he came face to face with his mistress, and beheld many gay ladies and lords in rich array, and many a lusty knight at the tourney before him. He rode into the jousting-place where knights were at the encounter; and he emptied so many saddles that all men wondered who he was that deserved such praise. When the tourney was near done, he beheld the steward and turned up his heels, so that all who looked on were adread; and then he rode back into the forest as lightly as ever did man. But it was all for naught. He rode into the woods 129 again, delivered up his steed and his armour, and dressed himself in his own clothes. The strange knight had caught venison for him, and he made him ready boun to go home and present it to his lady; as for help he wished none. Thereupon Lillian went to her ladies, and they all passed anon to supper. In the morning, he arose betimes, as soon as he might see that the night was spent, and went forth to that same green forest; and when he came to the place where he had been before, he laid him down unseen, in the shadow of a tree. The birds sang so pleasantly that he thought himself in Paradise; and to bear a part in that music, he sang for joy and love of his lady, and how she cherished him and was herself the flower of all the world; and he sang for delight in 130 the fair weather, the clear and soft air. His heart was as light as the leaf on the tree when he remembered his lady. He reached a spear to Dissawar, who took it and rode forth merrily; and soon he saw his lady clad all in white, so that it was a joy to look upon her. He saluted her gaily and entered the tournament; and if he had jousted well that other time, he was better by fifteen score this day. He hunted the knights hither and thither, as the hound chases the hare; and many he bore down to the earth, and some got their death-wound. He caught sight of the steward and unhorsed him; and then rode away to the forest as lightly as did a man ever. dare say; and then the child went home with a white hind as a present to his lady. When he arrived, as I heard tell, she marvelled greatly that he had not come to the jousting. But Dissawar arose full soon on the morrow, and blew his hunting-horn, and went into the forest with hounds of high breeding; and there he had great comfort in the sweet singing of the birds. As soon as he arrived at the place, he saw his fair lady, in apparel all of glittering red gold; and he cast a ring at her and went on to the tourney. He rode among them with such might that he dang13 down men and horses both; and as he ran through the field, with every stroke he dang one down. Not Sir Roland or Sir Oliver14 made such a stir at his jousting! When he beheld the steward, he dang him down, man and horse, so that both lay on the ground, and two of the steward’s ribs were broken. And after that, Dissawar rode away to the forest, as swiftly s a falcon doth pounce upon a bird. But it was all in vain, for he escaped to the woods, delivered up his armour and his steed, and dressed himself in his own garments. And while he was thanking the knight humbly, in came the two others that we mentioned ere, and said: “O blessed and dear master, you delivered us from prison, wherefore sweet Jesus must thank you; but this also is most certain, we promised you that if ever you needed help, we should render it to you speedily. To-morrow should be the marriage-day of the steward who beguiled you; but fear nothing, he shall not come near the bride’s bed.” Without more ado they took their leave, and he returned to his fair lady. As all the people were going home from the tourney, he went to his gentle mistress and saluted her. She arose betimes in the morning, and dressed her, and went and kneeled before the king. So presently she passed into the kirk, and married him, sorely against her will; and when the marriage was done, she went into her chamber and mourned there until dinner-time, when she was brought into the hall. The king and queen were at table, and likewise the supposed prince and sheen Lillian, and every lord and gentle knight was matched with a fair lady. Abundant courses were served, and wine in great plenty. They looked round and at last found him in a chamber, and there kneeled down, saluting him right reverently. And soon they have ta’en him by the hand, so that all the 135 people in the hall marvelled. The king was amazed and so also, the queen; but fair Lady Lillian was blithe. Then, questioned, he told them the manner of it all; how the steward had thought for to cast him down in the river and drown him, and his gold and his letters were taken away from him, and how that other made him swear an oath to get his freedom — “which will turn to his shame, in that I should be servant to him my father sent with me.” All this the steward might not well deny, and so granted that it was true. Then Roswall told the king all the manner of his jousting, and showed how he had been victor in the three days’ tourney. Anon they took the steward and hanged him high, and then passed on to the kirk and wedded Roswall to fair Lillian. No tongue on earth can tell the joy of Roswall at that time; and, wit ye well, if he was fain, yet was the Lady Lillian fainer. Meledas16 was no more blithe when she married Claudias, nor that most pleasant flower Belsant when she had Ronald for her lover. They ate spices and drank wine, and then passed on to the dancing. The king led out the queen, and Roswall, beauteous Lillian, and ever gentle knight had a fair lady; and so they danced till supper-time. Truth to tell, there was no knight that was not served to his liking at that 136 supper; and when it was ended, a bishop arose and said grace, and syne they returned to the dancing. The minstrels played with a pleasant twang, and now Roswall danced with the queen, and the king himself with Lillian. Every gentle knight had a fair lady, and the minstrels played with right good will till all had had enough of dancing. Again they ate spices and drank wine, and then all passed to their beds. Twenty days lasted the bridal, with carols and plays and dancing and tournaments. Roswall sent for the old wife, and told the king how she had taken him into her house and put him at school with her son, and how the master had treated him, and how the steward had noticed him and had taken him away from the old woman to be in his service and had loved him as his own son. And while the king marvelled again at these tidings, Roswall rewarded all that ever had done him good. First, he gave to the old woman enough gold to last her lifetime, and then, without delay, he made a bishop of her son; and the master that had instructed him, he appointed his own chaplain. And he made rich all those that had been kind to him, and rewarded the servants well, and eke the minstrels for their playing. In time, Roswall and the noble Lillian had five bairns, three sons and two dear daughters of peerless beauty. The eldest son became King of Bealm, the second of Naples after his father had died, and the third son was made Pope 137 of Rome. The eldest girl married the great Dauphin of France, and the second, the Prince of Apulia. Now pray we 17 Him that harrowed Hell, and died on the Tree for us, to grant us Heaven. Amen. When all these things were passed and done, Roswall went home to his mother, for his father was dead long time before; and she was well glad of him. And so Roswall and Lillian lived many years in good liking. God send him rest until Doomsday! 1 See notes on these names. 2 Bohemia? Beaune? Bearn” Probably the first. 6 So in the text. 7 Or, hes = has = Scotch for have. See note. 8 See note on these names. 10 See note on these names. 14 The two chief figures in the Chanson de Roland, and prominent among the twelve peers of Charlemagne in various chansons de geste. 15 A young nobleman who was without land. 16 See note on these names. No MS. of this romance is known, but it exists in numerous printed editions, of which the oldest is dated 1663. It was edited by David Laing in Early Scottish Metrical Tales, 1826, and 180 again in Englische Studien, xvi. It is certainly as early as the sixteenth century, and perhaps belongs to the fifteenth. p. 117. Ulysses, &c. Achilles, Troilus, and Priam belong to the legend of Troy, which was familiar in Scotland, having been several times treated in the fifteenth century. Gandifer is possibly an error for Gandelyn (= Gamelyn); but some editions read Gaudifer — for Godefroi de Bouillon? Clariadus is the hero of an enormous Scottish romance of the sixteenth century; but the name might have been derived from the earlier French romance from which this was translated. Philmox, I have not identified. Florentyn of Almayne is probably Florent, son of the Emperor Octavian, Almayne (= Germany) being introduced through the medieval conception of the Holy Roman Empire. On Lancelot, see vol. i. p. 183.
p. 122. Dissawar. This word has puzzled the critics. Percy suggested disaware (Glos.) meaning unaware, unwary; Child (in his Glossary; in the text, he declines to guess), dis and aver (Fr. aver, avoir), without possessions. This fits the sense on p. 122, where the old woman says he shall not be Dissawar, because she will adopt him; but does not explain her sentence on p. 124: “Sir, they do call him Dissawar, and aye he’s done since he came here.” Done what? The answer corresponding to the fact seems to be: disavow himself, i.e., refuse to tell who he is. Of course, he was bound by his oath to the steward not to do so. He is therefore the disavower, or in Scotch disawower, possibly corrupted into Dissawar, after its significance was forgotten. N. E. D. quotes a similar use of the verb: “Yet can they never . . . . disavow my blood Plantagenet’s” (Ford, Perkin Warbeck, IV., ii. 1634). But whether derived from dis-avoir, dis-savoir, or disawow, the prototype of the false name seems to be dis-conus (Lybeaus Disconus). p. 122. St. Julian’s sake. The saint who especially encouraged hospitality. p. 124. The noble French queen, &c. Impossible to identify. Henry V. and VI. married French wives, Mary Stuart’s mother was French — there are various possibilities. Lady Pelicane (or Pellan) must be a corruption, I cannot say of what. Philippie was possibly Philippa of Hainault, queen of Edward III., but another edition reads Phillis, and perhaps the reference is to Chaucer’s Legend of Good Women. Lady Christian (or Christaline in another edition), I do not remember. p. 125. Hector, &c. Hector was the opponent of Achilles at Troy. Oliver was the friend of Roland in the Chanson de Roland and other poems of the geste du roi. Porteous, perhaps Proteus? Emedus, perhaps Amadas? Predicase, perhaps Perdiccas, Alexander’s general? Liondale is possibly Lionel, but I know no such hero except in the ballads. Florent of Albanie — Albanie may be a mistake here for Almayne; but Albanie itself was familiar in allusions. Knight of the Arms Green, possibly Sir Bredbeddle, in the romance of Sir Gawayne and the Green Knight. p. 128. On a milk-white steed, &c. This initiates a series of three horses and suits of armour of different colours, on three successive days. 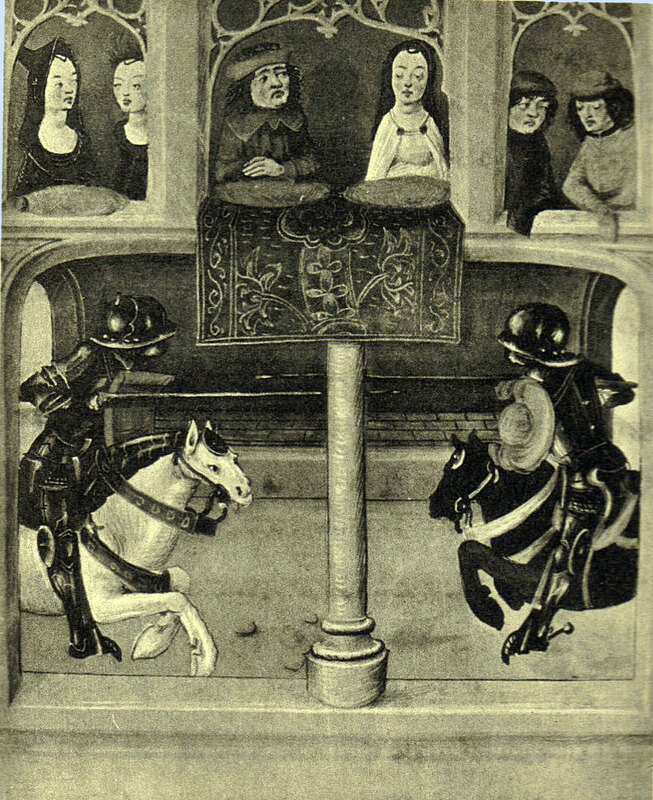 The episodes resemble a similar group of scenes in Ipomedon, where the idea seems to have been borrowed from the Lancelot attributed to Walter Map. In Sir Gowther, again, we have similar changes of equipment. See Ward, Catalogue of Romances, i. 734 ff. p. 135. Meledas, &c. Méliodas is a queen in Malory, and Claudas a king; but they are not associated. Here the reference may be to the romance of Clariodus and Meliador — worse corruptions have been made. Belsant married Ottuell, but Ronald (= Roland) appears in the same poem: Duke Rowland and Sir Ottuell of Spain. p. 137. Now pray we, &c. The repetition of the concluding prayer suggests that the lines between were an afterthought.